It is sometimes funny thinking about the metaphors that I use whenever I talk about my qualifying paper. Well yes, I have finally decided a few months ago that I would personify my qualifying paper into a baby, as outlined here (By the way, I just found it ironic that in that post, I was talking about being a father-to-be and yet, the accompanying picture was depicting a tomb. How opposite is that?). And so yes, Magnus has been born for quite a while now, and he was reincarnated once. It is time to chop him up, and reincarnate him one more time. I have my second draft here with me, and I am fixing it. The good thing though is that the issues that I have to fix are more presentational, rather than content-related. That is a good thing. It means that the revision isn't as hard as the first one. All I need to do is stir a little, microwave a little, reheat a little, and voila! So there, hopefully, within a few days, I can churn out a new version of Magnus. Time for my book review one more time. I just finished reading this novel by Tod Wodicka. In short, I hated it. It was a complete waste of my time. The only reason I read through it was because I never stop reading a book halfway. But, the book was awful. The main character is a demented old man with a rather disfigured nose, and yes, that nose plays quite constantly in the story. This man seems to be time-warped, well, he believes that he still is in the medieval period. He wears old clothes, acts old, and talks old. Because of that, he alienates his family. The main conflict basically arises from that aspect. If I were his family, I would have committed him to a mental asylum. Because that is what he is, crazy. He has a number of loose screws in his head. And using medieval logic as an excuse for drunkenness is just plain pathetic (Apparently, people back in the Middle Ages only drunk alcoholic beverages because water was dangerous to drink.). So yeah, you got this demented alcoholic, who acts like a child, even though he is past retirement age. So there, I returned it to the library, and now I am starting on this new book, by Stephen King. Wow, it has been a while since I last read a book by this guy. The last time I read one was back in August of last year, when I read about fatal cellphones. 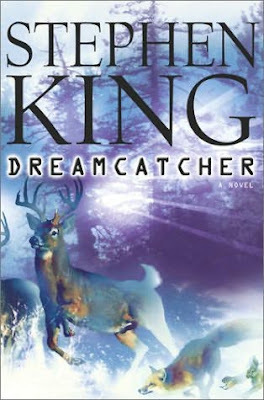 So now, I am reading Dreamcatcher. I remember seeing the movie, but the DVD was pirated, and the quality was bad, so I didn't persevere in watching it. Fine, I did not see the movie. Well, that doesn't matter since from my past experiences, Stephen King is better consumed as a book and not as a movie anyway. So this will be the book that I suppose, am taking with me during my trip to Denmark. And the good thing is, I don't even have to return it here, since I got this one in a used-books bookstore almost a year ago. If I am done, then goodbye! Hopefully this is a good one. I always stop reading boring books. Like you, I used to force myself reading them but I'm done with that. reading should be a pleasure, not a chore. I can't remember reading the Dreamcatcher... I like some of King's books but man, he has a wild imagination! Last one I read was Insomnia, some times ago and it's really weird.